When babies start crawling and walking, they are at more risk of getting hurt as they explore the surroundings. Baby gates are the safety measures that most parents should consider in order to reduce the risks of any harm to their children when they are moving around the house. There are various types of baby gates, but the best retractable baby gates are the most advantageous because they retract. There are no obstructions, trip-overs or swinging gates. Which are the areas to use baby gates in the house? Baby gates are mostly put in staircases, kitchen and dining areas. These are areas where children are more exposed to harm. A baby gate is useful in helping to deny access to these areas. Up to 52" or 72"
Babies in mostly try to push the baby gate harder as they trying to access a certain area due to curiosity. If the gate is not strong enough it may break and cause more harm instead. You do not want to purchase something that will only last for a few days. You, therefore, have to consider the durability of the material used on a baby gate. Since door sizes and staircase areas are different in every house it is wise to consider baby gates that are stretchable to fit in every door space and staircase area. Baby gates should not be complex to use due to cases of emergencies. For instance, they should be easy to lock and open. Some baby gates have fancy features like alarms that alert you when your baby tries to go through the gate. These are good features to consider in a baby gate. Is the baby gate high enough? The price of the baby gate. What brand is the baby gate? Whether it is approved by the Juvenile product manufacturing association (JPMA). One of the most common retractable baby gates is Retract-A-Gate Safety Gate. It is mostly recommended because it is certified by the Juvenile Products Manufacturers Association to be used at the top and bottom of the stairs. This baby gate can be found in the standard size of 52” and a wider size of 72”. It, therefore, can cover even the widest areas in a room. Since most parents carry their children in one hand, this baby gate is designed in a way it can be locked using one hand. There is no worry of where to keep the retract-A-gate after use. This is because you just need to unlatch it and it will wind itself up. This also saves time since you don’t need to install it each time when need to use it. The retract-A-gate is strong to withstand a force of over 200lbs. It can also be used outdoors, making it usable on dogs and cats. 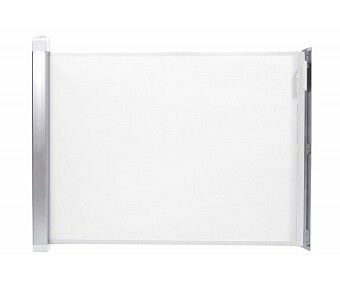 Retract-A-gate is durable since it is made of high-quality material and is resistant to scratches. 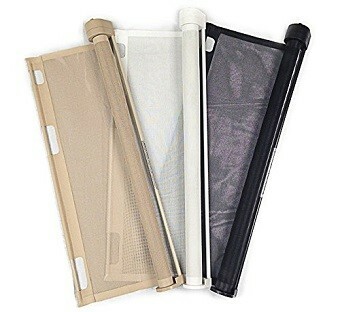 The material of this gate is also easy to wash, transparent and tough. Wide enough to be used in most spaces in a room. Children can pass under it if not properly fastened. It is easier for older kids to work it out. 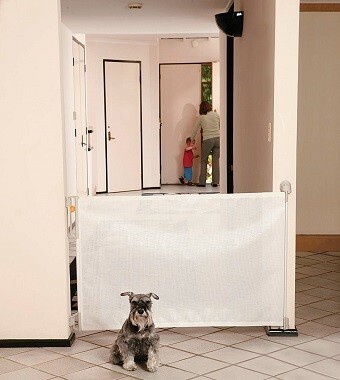 This gate, which comes in black and white, is one of the recommended baby gates that suits most of the rooms. It fully retracts causing no obstructions and less or no tripping. This Lascal KiddyGuard Avant Retractable Baby Gate has a square shaped aluminum housing and a tough mesh panel. It takes up to 220 lbs of pressure. It is, therefore, strong enough to support heavy babies. It easy to open and close but a bit complicated for kids to work it out. Opening it is made easy by the Avant’s timer. You can open and close it with a lot of ease. The Lascal Kiddyguard Avant can be put in any opening. Another good feature of this gate is that it gives you an indicator when locked. You can also install it on openings that do not exceed 48 inches. Blends in easily in any room. It can be locked or unlocked with ease. Has an indicator that helps you know when it is locked. It is safe when used at the top of the stairs. A perfect installation is required making it complex to install. It takes some time to install. 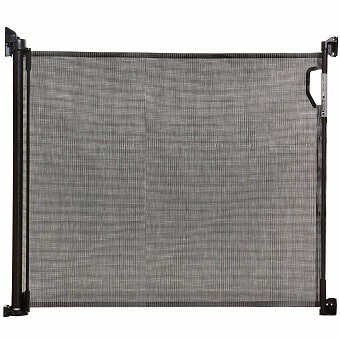 This is a baby gate that can be used both indoor and outdoor since it is made from a UV treated durable mesh that prevents it from fading when exposed to the sun. It is 55 inches wide and 34 inches high, so it can be used in most doors and staircase spaces and the height also ensures adventurous kids do not climb over. The Dreambaby retractable gate lasts longer due to the quality of material used in making it. This is a good feature to look for since you don’t want a gate that will wear out after a few times of use. This baby gate is easy to install and can be locked by use of one hand. There are also an extra set of mounting brackets that come with it therefore can be used in more than one location. This saves cost if you need more than one baby gate. Can be locked using one hand. It can be used both outdoor and indoor. It is wide and tall. Comes with an extra set of mounts. It is not strong enough to withstand a lot of pressure. Requires spacers when installing it to baseboard or skirting boards. 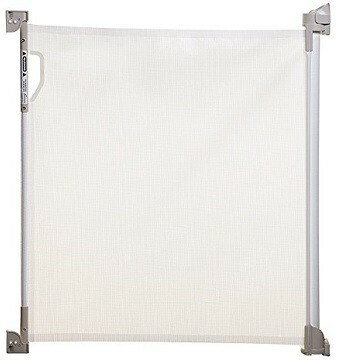 This is a retractable baby gate that is strong to hold a lot of pressure. It is also built with a material that makes it durable. The Gaterol Active Lite is 55” by 36.6” in size making it one of the widest and tallest baby gates. With enough practice, parents have been able to lock the Gaterol Active Lite baby gate using one hand. This is one of the best features because it makes it possible to lock the gate when carrying a baby. By use of screws, this gate attaches well and firmly to the wall. It is, therefore, recommended for use when raising a more curious strong baby. It also comes with two sets of mounting brackets. This allows it to be used in two different locations. This is a feature that you should look for in a baby gate when you have more than one space to cover using a gate in order to save on cost. The Gaterol Active Lite gate can be used both outdoor and indoor. Though this gate has many benefits, difficult installation is one of the negativities noted in it. It is tall and wide. Shipped with two sets of mounting brackets. Can be locked with one hand. Attaches firmly into a wall. Eliminates the risks of tripping. Requires practice to be able to lock it using one hand. This baby gate is designed in a way that makes it possible to lock using one hand. You are only required to push down to lock and push up to unlock. When properly locked it provides a mesh barrier that is strong to hold a lot of pressure. It is of size 50” hence recommended for use if raising pets. It is easy to install the Summer Infant baby gate since the instructions provided are clear. For it to be effective it is advisable to screw it into a wall stud though there some anchors that come with it. This baby gate is one of the few that is shipped with all the mounting devices needed for it to work effectively. Summer Infant retractable baby gate cannot be used outdoor since it is not weather treated. It should also be noted that it cannot be mounted to stair banisters. A locking mechanism that uses one-hand. Can be used for dogs and cats. Instructions provided for mounting it are clear and easy to follow. Cannot be mounted on stairs. To mount it you need a wall stud. This baby gate is 139.7 centimeters wide. This makes it stand out because it can fit in most door and staircase spaces. It is designed for use for both pets and children. Since it comes with two sets of mounting hardware, it can be installed in two different locations in the house. This feature makes this baby gate popular with most parents because it saves on cost that could have been incurred in buying another gate. The Bindaboo B1136/L821 Retractable Gate is light so it can be moved around with ease. It is also much recommended because it can be used both indoors and outdoors. 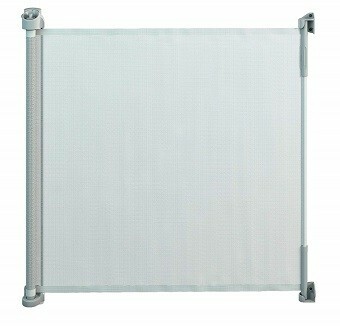 The Bindaboo B1136/L821 Retractable Gate is made of durable mesh making it is long lasting. 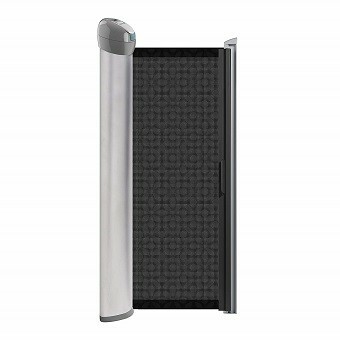 Its retracting feature also ensures that there are no obstructions when it is not in use. Comes with two sets of mounting hardware. Does not attach well on the wall. Cannot be locked using one hand. Difficult to roll and unroll it. Can My Child Be Able To Climb Over The Gate? Most of the retractable gates are high enough to prevent kids or pets from jumping over. The materials used to make the gates are also difficult to climb over for instance fabric and woven mesh. At What Baby’s Age Is A Baby Gate Helpful? Baby gates are designed to be used between ages 6 months to 24 months. This is because after two years of age most babies can be able to unlock the gate though there some gates with a complex locking mechanism that can be used. Can All Gates Be Installed At The Top And Bottom Of The Stairs? Not all baby gates are designed to be mounted on the stairs. It is advisable to research properly if you need a gate at the bottom or top of the stairs. Retract-A-gate and Stair Barrier baby and pet gate are some of the gates you can consider for use on the stairs. What Is The Meaning Of JPMA Certified? JPMA stands for Juvenile Products Manufacturers Association. This association checks baby products for safety. Retract-A-gate is one of the few baby gates certified by JPMA. To know whether a baby gate is certified by JPMA check for JPMA certified seal. Are There Retractable Baby Gates That Can Be Used Outdoors? Yes, there are many baby gates that can be used outdoors during all weathers. A thorough research is however needed before purchasing any baby gate to make sure it has an outdoor feature. Baby gates are some of the best innovations that have helped parents keep their children safe in and outside the house. They ensure the safety of the baby by denying access to unsafe areas in the house. However, shopping for one can be very difficult since there is a wide range to choose from with almost similar features. A good understanding of baby gates is, therefore, required to make a proper choice. There are a variety of baby gates available in the market today as you have read above with different features to fit your needs. All the retractable baby gates mentioned here are the best that I mostly recommend. The comparison made on the baby gates helps you choose the best gate for you with ease. If you need a baby gate to use outdoor, you now know what to go for. If you are looking for one that blends in your décor, there also a variety of choices to choose from without having to compromise on quality. Copyright © 2019 | BabyGatesPlus.com is a participant in the Amazon Services LLC Associates Program, an affiliate advertising program designed to provide a means for sites to earn advertising fees by advertising and linking to Amazon.